The enduring image many people have whenever they hear about a refugee camp is that of despair and desperation. An image of brokenness and sadness, teetering on the edge of hopelessness. An image of a displaced population that has given up; that is ready to let their dreams evaporate into nothingness. But in Kenya’s Kakuma Refugee Camp, some 800 kilometres north of the capital Nairobi, this narrative of despondency continues to be challenged every day. On June 9th this year, another layer of this narrative was peeled off, revealing an economic and cultural vibrancy in what is often thought of as one of the most desolate parts of northern Kenya. For one day, the world got to see another side of the lives of thousands of refugees who call Kakuma home. Challenging the stereotypes around refugees was the main mission of #TEDxKakumaCamp, a first of its kind event for TED, the influential conference network that hosts online talks on a range of scientific, cultural and academic topics. “It was a vision, a dream that made us all think we were crazy,” said Melissa Flemming, chief spokesperson for UNHCR, the United Nations aid agency that deals with global refugee affairs and a co-convener for the talks. The list of speakers included activist Riya Yuyada, athlete Pur Biel and teacher Mary Nyiriak Maker from South Sudan, Congolese film maker Amina Rwino and Sudanese poet Emi Mahmoud, as well as World Bank economists and aid workers whose personal and professional lives have in one way or the other been touched by Kakuma. 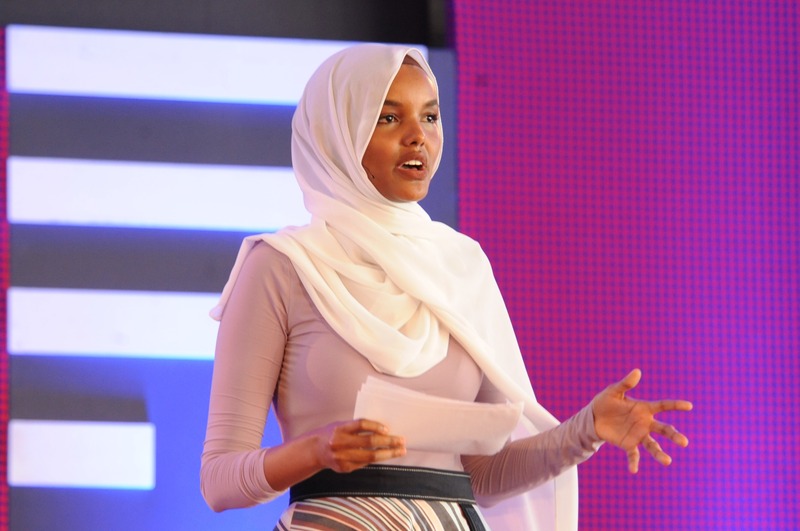 Halima Aden, a UNICEF Goodwill Ambassador, addressing the audience at the Kakuma Refugee Camp during the TEDx event. The refugee camp was set up in 1992, initially to take in mostly Sudanese refugees. It is now one of the world’s biggest refugee camps, hosting about 185,000 people who’ve fled war or persecution from 19 African countries. Globally, at least 22 million people live as refugees. “Setting it up was a logistical nightmare,” Flemming said of the event. A week before the talks were bound to happen, the bridge connecting Kakuma to the rest of the country was washed away as a result of heavy rains. For a moment, the organisers thought of calling it off. But sheer determination and an unwillingness to give up saw them push through, working with Safaricom to set up a new communication mast to boost the internet signal that would be relied upon by millions of viewers who were streaming the talk from across the globe. Kakuma, a busy complex of four smaller camps – Kakuma 1, 2, 3, 4 – had never witnessed an event of such magnitude. Over the years, the refugees have had people come in and tell stories about them. This time though, the refugees, custodians of the most intimate details of life at the camp, got a chance to tell their own stories in their own voices and through their own eyes. The first person to share her story was poet Emi Mahmoud. 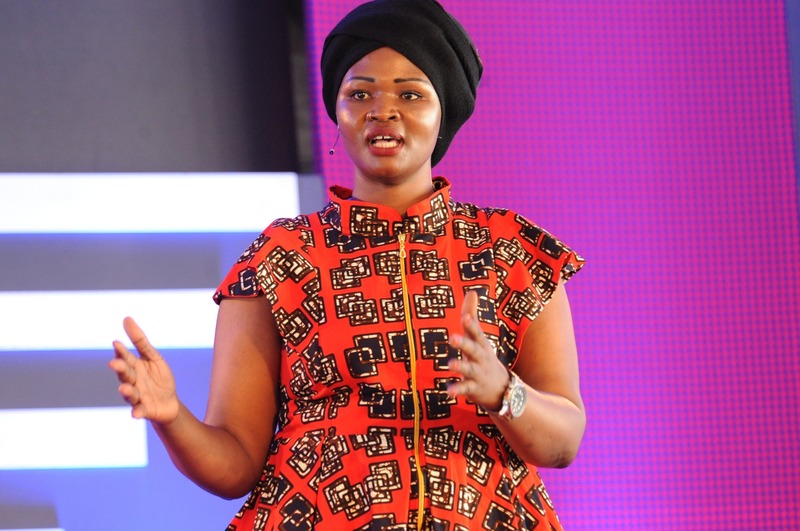 She walked onto the stage in a flowing black dress, head wrap and a necklace with a pendant in the shape of Africa. She owned the room. She talked about her past in war torn Darfur, her present and what the future portends for her. Riya William Yuyada is former refugee from South Sudan. Her prose was interrupted only by deliberate pauses in her speech and the faint purr from the fans whirring furiously to cool the stifling heat. She, like the rest that came after her spoke from a stage set up in a white tent in a school playground within the camp. “The worst thing about a genocide isn’t the hunger; it isn’t the murder. It is the silence,” she said, as she looked into the audience. But like many of those who shared the same stage, she refuses to let her story be that of darkness. Her story is that of light. “When I was seven years old, I was under the bed with my sisters and my cousin looking to my mother for guidance as soldiers pillaged outside. Fifteen years later, I was the closing speaker at my Yale graduation class,” she said, reinforcing the tone of the event. A common misconception over the years has been that refugees are a burden to their host communities and that they often end up draining resources from their surroundings. A May 2018 report by the World Bank’s International Finance Corporation and the UN refugee agency, however, estimates the worth of Kakuma’s informal economy at $56 million dollars. Kakuma is redefining what a refugee camp has always been thought to be. Refugees in Kakuma make up nearly 15 percent of Turkana County’s population. Despite these numbers, statistics show that just over one percent of these will be resettled by humanitarian agencies. 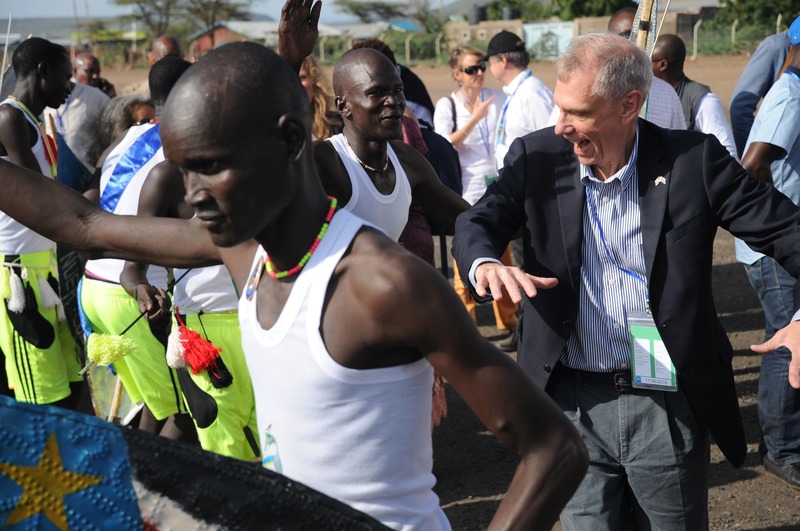 US Ambassador Robert F. Godec dances with refugees from the Kakuma Refugee Camp. And those that made it out never forget where they came from, or their duty to those who were left behind. “We are among the very lucky few who made it. There are some who never got out. There are millions more who never made it out,” Somali-American model Halima Aden says. Since her exit from Kakuma at the age of six, she has graced covers of magazines such as Vogue, walked in shows for top designers including Max Mara, and featured in fashion campaigns for global brands such as Nike. “It is our duty to never forget where we come from,” says the breathtakingly beautiful diversity champion, who one day hopes to return to Kakuma to work with refugee children. Just like Halima, Riya Yuyada never forgot. And after 13 years away from home and unable to pry herself from the embrace of a war that has been part of her since birth, she decided to go back to Juba, where her journey as a refugee began. “I returned because I wanted to build what was broken. I returned because no matter how bad things were I just wanted to go home,” she said. #TedxKakumaCamp was meant to showcase not only the cultural diversity and economic promise of the refugee settlement, but the resilience of the human spirit, and how if properly harnessed, the creativity of the camp’s inhabitants could be harnessed for good use. As the sun set behind the white tent and the crowd that had milled around large screens mounted for the community to watch the event, the world was on that day reminded that our need to overcome adversity is stronger than our collective tragedies, and that the resilience present in all of us runs eternal in Kakuma Refugee Camp.